Situated in the 'Medina' area only a short walk from the main windsurf lagoon and sandy beach. Apartment Ema has two bedrooms sleeping up to four people . It is located on the top floor in a quiet residential area, with a stunning Mountain view and views to the sea. Modern open plan kitchen with a washing machine. Local supermarket, ATM, post office and drinkies shop only a few minutes walk away. 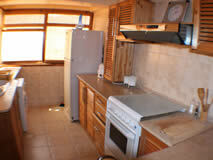 Facilites: Tastefully decorated two bedroom apartment with AC in the bedrooms and living room. Complementary Wifi. TV and satelite. Ema, the Scottish owner, lives locally and is your point of contact during your stay. Kitchen: The well equipped open plan kitchen has a breakfast bar, oven with four hobs plus extractor fan, and fridge / freezer. It also has a washing machine and plenty of cooking utensils. Indoor dining table and chairs in the living room. 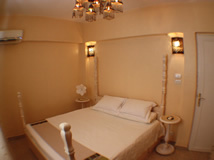 Bedrooms: One double and one twin bedroom, both with air conditioning. Bedlinen and towels provided. Lots of storage space. Bathroom with Shower, WC and modern sink. Extra's: Use the public beach free of charge or pay a small daily fee to use the hotel sunbeds and pool. You can also dine in any of the hotels on the beach and pay in cash. Only an 8 minute walk to the beach and 5 minute taxi ride into Masbat where the main restaurants and bars are located. An ATM is a short walk away.